Sarah Palin Front Row for Bristol's "Dancing"
Bristol Palin made her second appearance on "Dancing With the Stars," performing the quickstep to the tune of "You Can't Hurry Love" with professional partner Mark Ballas. This week, the "Mama Grizzly," Sarah Palin, was in the audience watching her 19-year-old daughter perform. 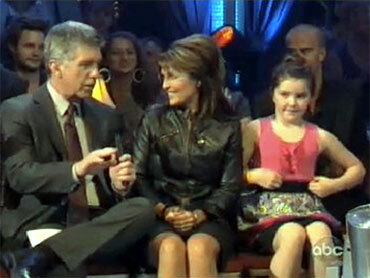 Show host Tom Bergeron asked Palin what she thought of Bristol's dancing. "It's amazing," she said, with millions of viewers tuned in. "It's great to see all this courage, joy and exuberance," she said. Asked who was her favorite dancer, Palin stumbled a bit but named "Bristol the Pistol." Palin and her partner scored 22 out of 30 points for their quickstep, improving upon last's week's 18 of 30 score. The top scorers were Jennifer Grey and Derek Hough with 24 points. Kyle Massey and Lacey Schwimmer also scored 22 points. Michael Bolton and Chelsie Hightower earned the lowest score of the evening, 12 points. The judges said Bristol needed to engage the audience more in her performance. "It's not quite there," judge Len Goodman told Bristol. "It was neat and precise, it's just needs a bit more flair....You've got to take chances if you are going to win 'Dancing With the Stars.'" Earlier in the week, Bristol Palin took her dance partner to check out her roots in Wasilla, Alaska. The former Alaska governor was on hand to meet the professional dancer but not dad, Todd Palin. With the cameras rolling and lights on, Bristol and Ballas entered the Palin home. Sarah Palin told Ballas, "I'm all star struck...thank you for taking care of our girl." She asked, "How does she do that do, do do," referring to her daughter's newly acquired dance moves. Ballas asked Bristol how she liked Hollywood. "I like it, but I like Alaska better," she said. Prior to Sarah Palin's appearance on the screen, some boos was heard from the "Dancing With the Stars" audience, but it wasn't made clear where the boos were aimed.